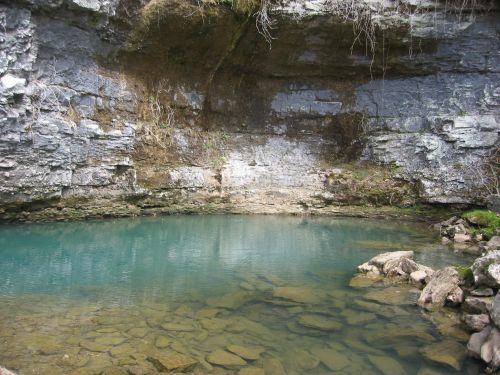 Joe Dabbs has been talking to the land owner of Dry Creek (in Alabama). There is a good chance we will get permission to get back in there. We haven't had access in years. 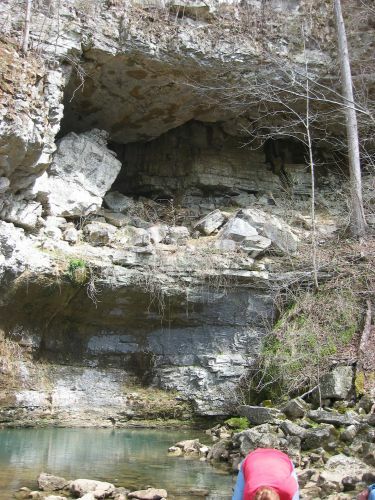 The sump is about 500' into the cave (in low water) and about 1500' long. Depth is around 10'. We know of about 2 miles dry, past the sump. During high water, the sump starts at the entrance, and is nearly a mile, with some big air bells. Oh yea, the water is about 58 degrees, and visibility less than 10'. The water level was higher than I have ever seen it. I have seen it 2 feet below the entrance, with airspace for several hundred feet. Saturday, it was 14 feet above the entrance. Given that the entrance is 2 feet high. the water was about 18 feet above summer levels. The line was in pretty good shape. Joe had re-lined it the last trip he was in there. He isn't sure when that was, but it had to be nearly 20 years ago. The entrance wasn't blocked either. It used to have a gravel choke that had to be dug out nearly every trip. I think there must have been a heck of a flood that kicked all the gravel out. I suspect that is why Joe re-lined it. I did several dives in there backmount (in the olden days) and had to dig for all of them. Saturday it looked easier than Cow to get into. I was sidemount, but had over a foot of head room. AJ Gonzalles and I went in almost 2000 feet, and didn't see any airspace. It is hard to believe the big front room was totally flooded, but maybe the line goes around the edge of the room, and not across the high part.